The rebuilding process for next season is already firmly under way at Kettering Town. The Poppies confirmed this week that popular winger James Brighton and goalkeeper Paul White have signed contracts to keep them at Latimer Park next season. With Lewis Hornby and young trio Ben Baker, Ben Bradshaw and Jack O’Connor already under contract, it has been a good start to the summer for the club. Having underachieved during last season, which ended with a 2-1 success at Banbury United on Saturday, Kettering will be hoping to be amongst the challengers in the Evo-Stik Southern League Premier Division in the next campaign. There are set to be more comings and goings as the summer progresses as boss Marcus Law and technical director Alan Doyle get to work on the transfer business. And Doyle was pleased to see Brighton and White commit themselves for another season. “I was involved in bringing James to the club, I knew him from when he was at Cambridge United and on loan at Cambridge City,” Doyle said. “He’s one of these lads who we like to call a ‘seven out of 10 player’. “He is consistent with his work-rate and he’s a threat on the left side. “He has had a few clubs after him because he performs well week in, week out so we are pleased he has chosen to stay. “With Paul, I think he did very well for us. “His kicking is good, he comes for crosses and his communication has really improved. 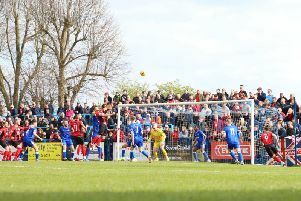 Doyle, meanwhile, insists the Poppies’ aim will be to try to challenge in the upper reaches of the table next season, although he believes the division will be as tough as ever once August rolls around. “We want to try to be in there fighting for the play-offs and promotion,” he added. “The name of Kettering Town still carries real weight but we aren’t the same club as the one people remember. “The fans want us to get back to that level and we do as well but it takes time and we will be doing all we can to get the right squad in place. “It looks like the Southern League will be even harder next season with the likes of Royston and Hereford coming into it.